The Waning Moon is the time when the moon is descending from her fullness until we come once again to the darkness of the New Moon. As the external moon is waning in energy, this is a time where you may also feel your personal ebbs waning too. In Priestesses of the Moon, we call this the Enchantress Phase. A time when we are more internally focused, there's an interest toward the mystical, dreamy, powerful, witchy and sensual aspects of our selves. You may find yourself needing space to be vulnerable and raw with your emotions. The Waning Moon phase is the time for less productivity and more creativity! Art projects, dancing, writing and fully expressing yourself in ways where the final project isn't as important as the actual act of creating. Waning Moon Mantra: I simplify. I release. I dream. I trust. Each day as the moon wanes make some time to sit with your self in quiet contemplation. Just for a few minutes with a hand on your heart and a hand on your womb focus your intention on being present with your emotions. Say to yourself, I feel... Witnessing each emotion is enough. If you wish to take it another step further you can journal on if the particular emotion arising within you has a message for you. We'd love to hear how you honor the Waning Moon time, please share with us in the comments! Full Moon in Sagittarius Blessings! The Full Moon is exact on Tuesday, May 29th at 7:19 AM PDT. Sagittarius is a Fire Sign that is ruled by Jupiter and it is the sign of the Quest. The sign that reminds us that we are on a journey to Remember and Know Thy Self. That we can aim our arrow at what we long for and with precision, presence, and some magic, we can achieve our desires. It is so vital as the world is alive with chaos and violence that we, as women who are reclaiming our Truth, are clear about what we want to create and embody in this world. As we know, there is no more time to wait. Your quest is one of the most significant things you can be focused on… because your quest is what anchors you as you evolve into the most powerful and strong version of yourself. In Priestesses of the Moon, your Quest always guides you back to deepening your relationship with the Moon, to your Blood, to certain rites of passages that you did not receive as a young woman. Your Quest invites you into an honoring relationship with your wombspace so that you re-connect with the codes of the Sacred Feminine that reside inside. This will contribute greatly to understanding who you are, at a DNA and Spirit level. What you find on your quest will be some of the greatest gifts you could ever imagine. When you come into relationship with the life force that animates through you, you, alongside everything in your life, will shift, in a beautiful way. So sister, what you are questing for right now? What dreams and desires are you walking towards? How are you holding this prayer every day so that you can greet your dreams in the next coming months? How can you honor your Blood? Your Wombspace during this Full Moon right now? We would Love to hear from you. Share in the comments what you are uncovering within your self. This Waning Moon, as sparked by the half moon in Aquarius with Sun in Taurus is a powerful portal for letting go of anything that stands between you and the dreams you have for your life and for our world with great love. What is now ready to dissolve and be released (body, mind, and soul) to make space for your visions to grow? How can you honour that you are both light and shadow? Life and death, masculine and feminine? In our world of polarity, one cannot exist without the other and the phases of the moon remind us that we are ALL of the cycles of life, internally and externally. This is a great time to downsize and let go of material things that aren't useful, inspiring or no longer bring you joy. It's an auspicious time to nourish your body temple, slow down, listen to the quieter voice within and honour the simplicity of Being. How can you welcome the Wisdom of this Half Waning Moon into your life? Share your comments over on the blog for sisterhood inspiration! 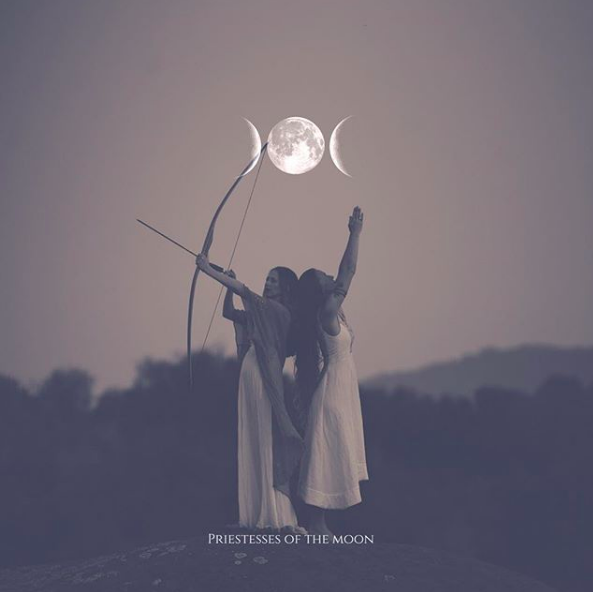 We are getting so excited because Priestesses of the Moon will be launching very soon! In the meantime, keep your eyes open for more waning and waxing moon magick like this every waning and waxing moon time. We'd love to know, have these blogs been helpful in supporting you during the lunar shifts each month? What are you noticing most as you connect deeper with your own lunar rhythms? We'd love to hear all about it, please share in the comments!